In a previous blog post, I explained the calculation of the filling height in open geometries and vessels. Unlike open vessels, the calculation of level in closed geometries, such as gas-tight tanks or pressurised vessels, requires a compensation of the pressure of the gas enclosed above the liquid with the hydrostatic pressure measurement. Level measurement in closed or pressurised, thus non-vented vessels requires an additional pressure measurement of the enclosed gas by a second pressure sensor. In a closed vessel, the pressure measurement is made, primarily, using standard industrial pressure sensors which are mounted at the side of the vessel or tank. Now, how does one calculate, from the hydrostatic pressure, the filling height of a closed, non-vented or pressurised tank or vessel? 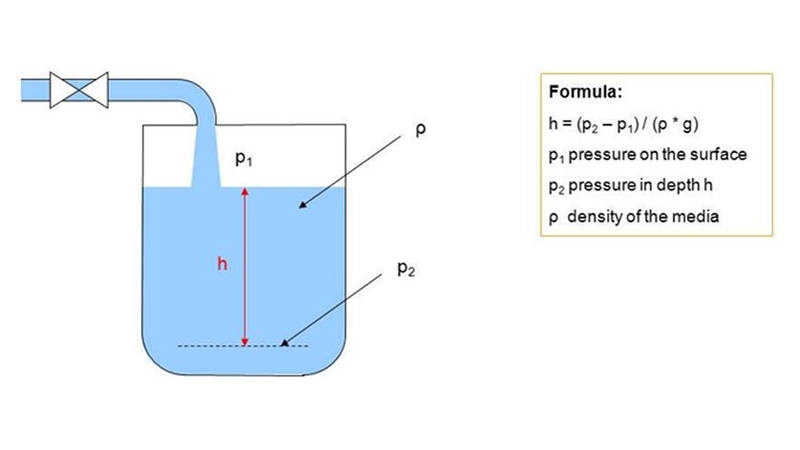 The level in a closed vessel is calculated by the following formula: h = (p2 – p1)/ (ρ * g) p2 = hydrostatic pressure [bar] at depth h p1= pressure of the enclosed gas in the vessel [bar] ρ = density of the liquid [kg/m³] g = gravitational force or gravitational acceleration [m/s²] h = height of the liquid column [m] A typical application is measuring the level of a volatile medium such as gasoline in a sealed, non-vented vessel, where an overpressure forms above the liquid, which can’t be compensated by the atmospheric pressure due to the lack of venting. This pressure must be measured by a second pressure sensor, since the gas enclosed above the liquid results in a higher hydrostatic pressure measurement, even though no real change in level has occurred. (Please use our pressure unit converter for a calculation by Psi, Pa and more) p2 (hydrostatic measurement at the bottom of the tank) = 2 bar p1 (gas pressure measurement) = 1.2 bar p1-typ (typical gas pressure) = 1.3 bar ρ = 750 kg/m³ g = 9.81 m/s² When compensating the hydrostatic measurement with the gas pressure, the liquid level can be measured very accurately using the hydrostatic pressure. However, if you decide not to use an additional pressure measurement for the enclosed gas, if you work with an estimated value, e.g. based on the typical prevailing gas pressure, even small pressure fluctuations in the process lead to major miscalculations of the level. So, even a small change of 100 mbar in the gas pressure may lead to a large measuring error of the liquid level, like 13 % in this example. Specifically a lower measurement could result in a process-critical error such as overflow of the medium from the tank, or the contamination of following vessels in the process chain. It is therefore imperative to compensate for the additional gas pressure within the level calculation in enclosed, unventilated or pressurised vessels. WIKA offers various solutions for the hydrostatic pressure measurement of level. For further assistance in selecting the pressure sensor most suitable for your application, please use our contact form.